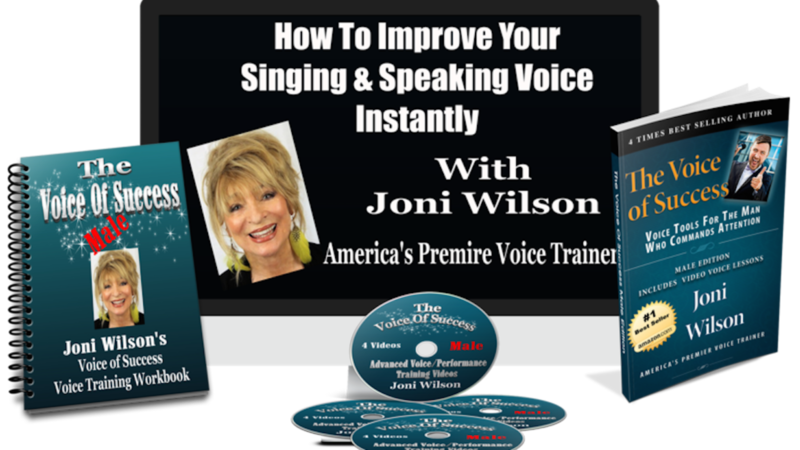 Joni Wilson's Video Training System has everything a man needs to create the perfect voice to deliver his unique message! "The Voice of Success, Male Edition was created out of popular demand from my male clients and students who were left with many unanswered questions about the mechanics of how and why their voices worked perfectly one day and "bottomed-out " the next. There are many similarities between the female voice and the male voice that general voice training covers, but those subtle differences that fall-through-the-cracks of standard voice training are the ones that cause the most frustration. I have always had an inquiring mind when it comes to education. My "why" questions could no longer be satisfied with: "Because I said so . . ." answers. To separate the male and female voices by gender was a very eye-opening task, but to be true to my training, I could no longer lump both voices together in the same books or videos, and still "dig" as deep as I wanted to go." By popular request from her clients, Joni Wilson, America's Premier Voice Trainer has now turned her attention to the Male Voice. Joni is finally answering her many requests to add a male version of the Voice Of Success to the Wilson Voice Series. In over 20+ years of teaching both male and female voices, Joni is familiar with the frustrations of both genders when it comes to creating the perfect voice to deliver their message, and also the many differences in the training of a male voice and a female voice. In today's obsession with gathering information on-line through video, a pleasing, audible voice can make the difference between success and failure of a product, a podcast, a webinar, a stage presentation, and even a one-on-one business proposal. In this video course for the male voice, Joni covers every facet of the male voice from puberty to old age, from increasing power and range to breathing problems and vocal weakness due to overwork and health issues. Joni is known internationally for digging deep and tackling the big "whys" of the male voice. Not only does she pinpoint the problems, but she lays out the reasons why they occurred and how to fix them so that they stay "fixed". To Joni, there is no such thing as an aging voice; there is only an untrained voice. The voice is an instrument, but it is also mechanical, and once the secrets and the mysteries of the voice are uncovered and exposed, curing the effect is easy when you understand the cause. "How do I add power to my voice without straining?" "How do I overcome stage fright?" "How do I "deepen" my voice to sound older and more experienced?" "How do I keep my voice from shaking?" "Can I really get rid of my accent?" "People say I mumble, what can I do to correct that?" "I can't stop clearing my voice, can you help me?" "I used to sing, but now my voice sounds weak, what can I do?" "I want to do my own commercials, can you help me become a voice-actor?" "I'm always out of breath when I give my presentation; I need more breath Power!" "I have a tight jaw, and it's hard for me to open my mouth, can you help me?" For a limited time only the price has been reduced from $297!